Not all pet parents like the colorful ceramic bowls that leave beauty and wonderful feeding experience. 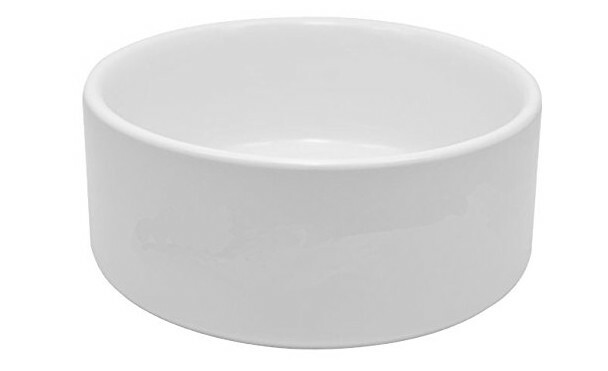 Some people like the plain ceramic dog bowl due to some reasons, for example for keeping the pet safe from coating material which this is proven that coating doesn’t contaminate the food. In fact, some people believe this! Other reasons that occur once we asked about it is they want to make their own custom dog bowl. Finally, we end up in difficult search on where to find the best plain ceramic dog bowls. But we have sort of types that can be your list. Check them! The bowl features standard round design with 7-inch at the widest point and 2.5-inch deep. The bowl can hold 3 large cups of dog biscuits. This is a white blank bowl that allows you to make a custom design or simply to make it as the dog feeder. The maintenance is easy by just doing simple handwash. For such great value, the bowl is pretty cheap! This is one of the largest stockists in the UK with competitive pricing and quality. With the same dog bowl design like the Longforte, the BestSub items’ offer a 7-inch diameter and 3-inch deep which can hold up to four cups of water. You can make your personalized dog bowl with your own design on this white item. Best Blanks offer sublimation ready cat and dog bowls with heavy duty material so you can make your own custom bowl. The dog bowl is made of solid ceramic that is safe for dishwasher and microwave with a 7-inch diameter and 2 7/8-inch height. They also sell dog-bowl wrap for making a unique bowl. Another heavy duty sublimation dog bowl you can put on the list is from Sublimation101. You can personalize the bowl with the photographs, image or everything that works on ceramic. The bowl has a 7-inch diameter and 2.88-inch height and bright white sublimation surface. To get the best result, make sure you bake it in the oven with the temperature at 400 F around 10 minutes. After that remove paper immediately. This is a great dog bowl you can owe for your business or your own custom bowl. This is a perfect plain ceramic dog bowl with a 7-inch diameter and 3-inch high which is very good for the larger breed. Despite selling the bowl, they also sell another accessory like pet mats, pet tags, collars, and leashes. Bake the bowl in the 400-425 F with medium-heavy pressure around 11-18 minutes. Use the TexPrint or DyeTrans for the best result. That’s all the plain ceramic dog bowls list you can visit. Hope you will find the best products that meet your need and the size of your furry friend. Make sure you also read the instruction as well and learn how to make your custom bowl with its accessories. If you think you are too busy to do this, just contact a pro to make your own custom bowl for the plain ceramic dog bowls.